Hello everyone! Welcome to Week Two of the CSA. We are working our way through some of spring’s finest offerings: crunchy, cool radishes, tender spring greens, spicy mustards, collards, plus a few other early season treats. This week’s box is quite greens-heavy, and it’s one of our favorites as we eat a giant salad for lunch or dinner almost every day. Ever wonder why the first few boxes have so much leafy green produce? In two words: location and timing! Our parts of Minnesota and Wisconsin have (increasingly) unpredictable spring weather, with cool soil temps lasting well until mid-May, lots of wild storms with rain, wind, and often hail, and even the occasional late-spring cold snap. All of the lovely items in your boxes this week are remarkably hardy and will tolerate the conditions that they have indeed suffered this week. The second factor behind why you get what you do is timing: some of the much anticipated produce like corn, tomatoes, and squash take up to 110 days to reach maturity, so we need to plan other tasty treats to fill in the spacing. And plan we do! Brandon spends nearly the entire winter researching crops, making ideal box lists, tracing the timing backwards to know when to plant seeds, and making sure that there are enough successions of every planting to ensure a steady harvest. Whew! We know most of our members were affected by the giant string of storms and severe weather over the weekend, and the farm suffered a bit, too. We had several washouts in the fields, and plenty of row cover got blown away. All of this was easily remedied, and thankfully there wasn’t too much crop damage. Besides picking up after the storms, activities on the farm this week included the ever-lovin’ weeding that we do every day, planting the last succession of brassicas (almost 600 cabbage alone!) and preparing for the arrival of our new walk-in produce cooler. This is one of the most exciting additions to the big red barn since it will allow us to harvest everything, wash it, chill it, pack it, and then give the boxes several more hours of chilling prior to being transported to you. What this means for you, dear members, is even crisper, longer-lasting produce than ever before. What this means for us is a more merciful harvest schedule. Everyone wins! Ready to learn more about what’s in your boxes this week? 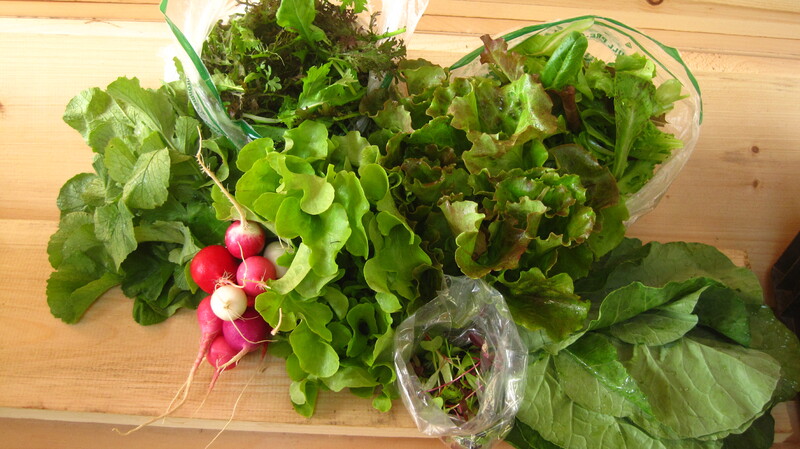 There are two bags of cut greens in your boxes, one is Spicy Salad and the other is Spring Greens. You may recognize the spring greens from your co-op or favorite restaurant, they are the larger, brightly colored and variously shaped baby lettuces. We make our own custom blend of spring greens using 23 different varieties, hand blended at the seed stage and then planted all together. Your other bag of cut greens is the spicy salad mix. This is one of Brandon’s favorite treats this time of year-he (most of us, really) is crazy about the spicy, peppery, and at times nutty flavors the mix provides. The tender, beautiful, small leaves are gorgeous eaten fresh as a salad, sauteed with a little olive oil and garlic as a healthy side for a meal, or scrambled in with your breakfast eggs (a daily occurrence around Sleepy Root!) 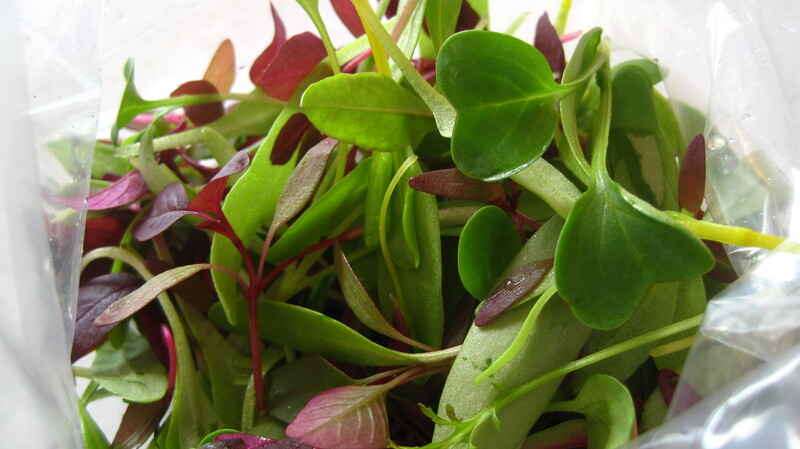 They are also a great source of Vitamins A and C.
Medium and full shares got a special treat this week: Micro greens! One of my projects on the farm is the creation of our micro green program. Every Friday about 20 trays are seeded. It’s really fun to choose what seeds to sow, especially since there’s a lot of color and shape variety in the world of micros. This week’s blend is amaranth, swiss chard, broccoli and radishes. I recommend using these nutrient-dense beauties as you would an herb or garnish: that is, sprinkle them lightly over a grilled lamb chop or sauteed scallops, garnish your salad of head lettuce for a burst of intense flavor and color, or do like we did for breakfast yesterday and place them over your poached eggs on toast with hollandaise sauce. Yes! Thanks so much for your continued support, and keep in touch! A few tips and tidbits: Don’t forget to put the collards in a bag to keep longer. Hopefully you’ve eaten your greens from last week and have a few of those plastic produce bags around. For those of you that have full shares, and therefore are receiving cauliflower or broccoli: don’t be concerned about the purple of the cauliflower heads! That pretty shade of lavender is a natural reaction to sunlight. Microgreens yay!!!! They are adorable! Everyone is sampling the spicy spring mix in my office… i wont have much left tonight!